( Kumiko's post) Lunch inspired by our Mahabharata-themed book project! Our new Mahabharata-themed book project is taking shape. 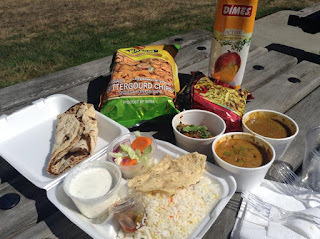 We were inspired to have a picnic with Indian takeout food this afternoon. There are a couple of good Indian restraurants and Indian grocery stores in Bellevue- Redmond area:) — with Kenneth E Lawrence.